A classic treat to do for Father’s Day is to snuggle in bed with da-da and bring him breakfast in bed! This is my husband’s first Father’s Day and we want to do it right. He works incredibly hard and does so much for our family so we thought letting him sleep in and then bringing him breakfast in bed is the perfect way to start off his day. 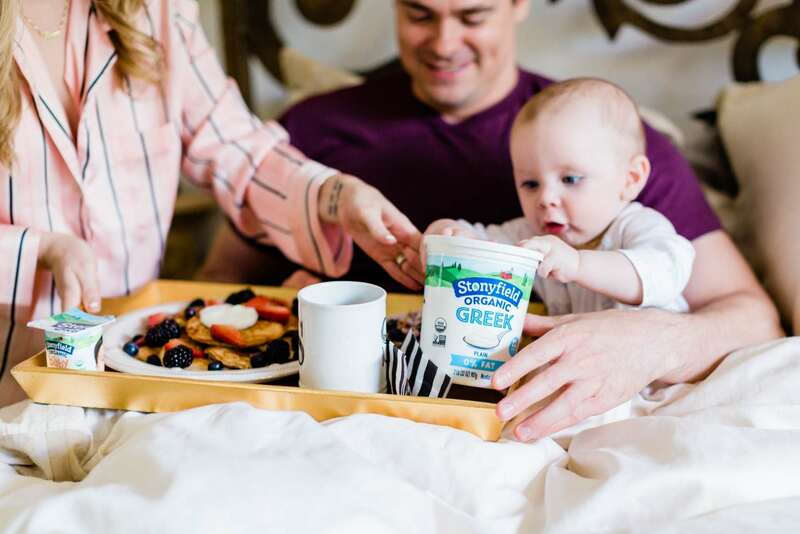 Doesn’t every parent want to sleep in, wake up to baby hugs and a delicious meal? I know I sure do! Here are two easy, delicious, and daddy approved recipes to make this Father’s Day. Put your bread in the toaster until they are nice and toasty. Spread the Stonyfield Greek yogurt on top of each slice. Berries should be washed and sliced. Place them on top of the yogurt on your toast. Lightly sprinkle the coconut flakes and chia seeds on top! This is super quick to make, is filling and delicious. In addition, It’s an easy recipe that makes you look like you’re a pro in the kitchen! Doesn’t it look pretty, too?! Put all ingredients in the blender or a mixing bowl and blend or whip until the consistency is very smooth. Heat a pan with about 1 tablespoon of coconut oil or butter. Repeat until all the batter is gone (or cook them all on one large griddle). You can top it off with some berries, a dollop of Stonyfield Greek yogurt, and lite syrup. Even though you are making pancakes from scratch, this recipe could not be simpler. Also, It’s super tasty and is definitely a better alternative than those boxed mixes. This breakfast has become a favorite in our household! Liam loved being able to sit in bed with his dad and eat breakfast together. Also, he had his YoBaby Stonyfield yogurt while dad had the yummy creations we made. Such a special treat for them both! I know that this will be a memory that Brian will never forget — father/son time “dining with dad.” Hope you all have a happy Father’s Day!